NAD is a kind of coenzyme existed in all living cells, it is an essential coenzyme in modern biocatalysis. 2) NAD involves oxidation reduction reactions in organism, it transports and deliver the substance in the reaction, transfer of electrons; bioconversion reaction. 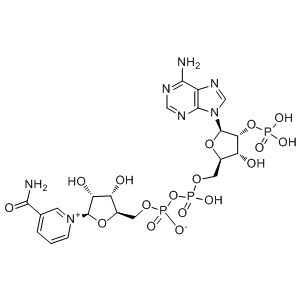 3) NAD can be used as a direct template for drug design, it also can indirectly change the activity of action on enzyme by designing enzyme inhibitors or stimulants based on the structure of NAD, or it can directly inhibit the biosynthesis of NAD. 4) NAD is possibly to become to be a very important anti-aging ancillary drug. The hot product Sir2 protein in modern biological research is just a deacetylase enzyme relying on NAD, which main function is to prolong life cycle of cell (anti-aging). It is a necessary coenzyme in organisms, it is used in biochemical and pharmaceutical research.